Looking for fundraising ideas for a short-term mission trip? Your group is going on a mission trip. That’s exciting! But, it can sometimes be difficult for leaders to brainstorm ways for your group as a whole (or individuals going on the mission trip) to raise enough money to go. We’d like to help you easily come up with some ideas. Here’s a free list of 110 creative fundraising ideas for youth mission trips or other church group mission trips to get you started. P.S. Want to print this list or read it as an eBook on your Kindle? Sign up on an online fundraising website. Numerous sites allow potential donors to conveniently contribute to your cause. Design a t-shirt and host a sale for your friends, family, and members of your church community. Host a movie night at your church and encourage admission by donation. Online social media (ex. Facebook, Instagram, Twitter), blogs, and email (yes, really!) are great ways to not only increase awareness of your efforts but also many of these outlets provide their own ways to raise funds or contribute to your cause. Many local restaurants offer fundraising opportunities, with a portion of the sales going to your cause. Ask friends, family members, and members of your church community to donate items and host a garage sale. Sporting events are great ways to get the community and youth involved in an exciting way. Small prizes for the winners can foster the competitive spirit. Get permission to host your car wash in a safe, moderately trafficked area. Buy supplies and make signs to promote the event. Using index cards, fill a wall with numbered cards for people to select and donate the amount from the card. During the Christmas season, some stores will allow you to set up a gift-wrapping table by donation. Contact local businesses and ask permission to set up a change collection jar near the checkout area. Themed parties are a fun way to attract large audiences. An entrance fee is all you would need to aid in your fundraising goals. Ask members of your church community or local business to donate items to be auctioned off. Each item has a sign-up sheet, where bidders walk up and place their bids on the sheets. Writing a letter asking for support is a classic fundraising idea. Be sure to answer the 5 most important questions: who, what, when, where, and why. Animal shelters, fire departments, your local YMCA, and other local organizations are often good places to coordinate fundraising efforts with. Host a coffee house in your church, or pair with a local coffee house to have part of the proceeds go to your fundraiser. Host a Valentine’s dinner open to members of the community and charge an admission fee. Who doesn’t love spaghetti? Hosting a spaghetti dinner is a great way to raise money, as well as providing a meal for the community. Set up bags for collecting cans and bottles at your church, school, or sporting events. Take the recycled items to a center and collect the refund. Find a talented band or bands that are willing to play for free or cheap and host a charity concert. Charge an admission fee and sell concessions during the event. If you know any hairdressers, hosting a cut-a-thon is a great way to raise funds. Ask him or her to donate a day to volunteering to cut hair for donations. Host a pancake breakfast at your church for the community to come to, and have the funds contribute to your cause. Create a service board, where church members can post jobs they need done, with the price they are willing to pay. Other church members can then select and complete the jobs, with the proceeds going to your fundraiser. Host a dodgeball tournament with a small fee, and have your youth students invite their friends to it, for an enjoyable and exciting activity. Encourage the members of your church to come forward with their various talents, and put on a show for the community to raise funds. 5k Runs and Fun Walks are great ways to raise money for your cause while also encouraging the church body and local community to stay active. Host a chili cookoff, with members of your congregation competing for the title of best chili chef! Make sure they cook extra, as the remaining chili can be sold off for more proceeds. Have your youth students put on a performance, while hosting a dinner for the guests. The dinner-and-a-show combination can even double as a great outreach to your community. Have a tree-lighting event at Christmastime, with a by-donation entrance fee. Every community has their fair share of craftsmen! Have members of your church body put on a craft show, with the proceeds from the items sold going to your cause. Host a trivia night at your church, with snacks and refreshment s. It can be Bible trivia, general trivia, or whatever category of trivia you prefer! A small entrance fee and charges for refreshments could make a very successful night. Ask members of your congregation to donate books and then host a book sale, open to the community, at your church. Host a karaoke night at your church and charge an admission fee or ask for a donation. This is a great event to pair with a raffle. Set up some lemonade stands in your local community for those hot summer days, with youth members rotating shifts. Encourage homemade lemonade for a more meaningful experience. Have your church choir, youth worship band, or various church members organize a caroling group around Christmastime and carol through your local community. Ask for a small donation after each house you stop at. Collect a list of recipes from friends, family members, and your congregation. Compile the list into a recipe book and sell to members of your community. Hosting a sub sale is a great idea for around the Super Bowl! Take orders from members of your congregation and your group can make and deliver pre-ordered subs. Host a Thanksgiving dinner open to members of the community and charge an admission fee. When fall comes around, offer to rake leaves for local homes, and contribute the proceeds to your fundraiser. Have youth members look for part-time or full-time employment, with part of their wages going towards the outreach. Host an ice-cream social at your church, with a small entrance fee. Offer to mow local properties in the spring and summer to raise funds. Host a raffle, with the prizes being gift cards to local establishments. Parents can drop their kids off at the church for a night out. The mission’s team members plan activities and snacks for the kids. Participation in this night can either be donation based or an amount per child. Consider using an online shopping fundraiser. Certain sites will offer deals and bargains for online shoppers, with a percentage of sales going to your cause. Have youth members offer to walk dogs in your area, and contribute the proceeds to your cause. Host a fun fair, with food, drinks, stands, and games! Advertise through your local community, and use it as a local outreach. Divide the cost of your missions trip by the number of miles to your destination, and have church and community members pledge to buy a length of the trip. Ask to set up a concession stand at your local high school, college, or professional sporting events, and contribute part of the proceeds to your cause. 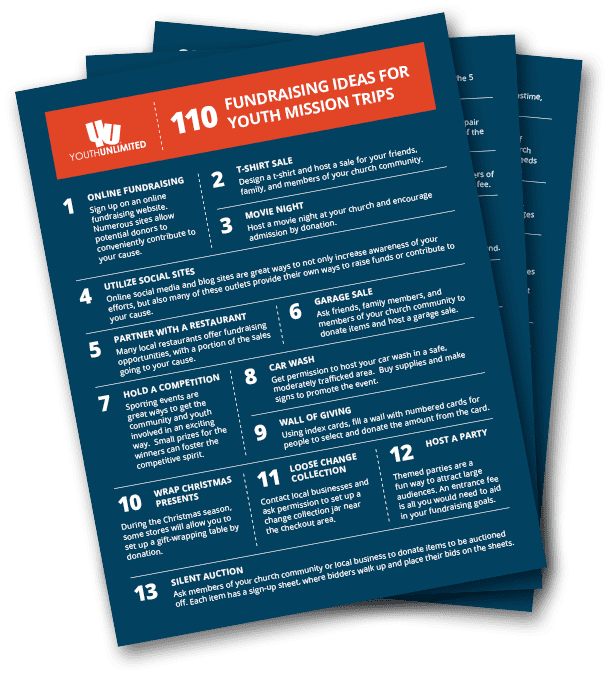 For more fundraising ideas, download our FREE complete list of 110 Fundraising Ideas for Youth Mission Trips below!